Athletes often experience flow when they perform at their peak as every ounce of strength and focus is needed to achieve victory. Thoracic surgeons at the operating table, wielding a scalpel, working on the most critical part of the human body are in flow. Students defending their doctoral dissertation in front of the graduate board are in flow (I can attest to this). These are just a few as there are many great examples of flow, but you get the idea. As the description above suggests, there needs to be clear, attainable goals and immediate feedback about progress. What better way to have clear, definable goals than a well defined trading plan and what better place to receive immediate feedback than the market! 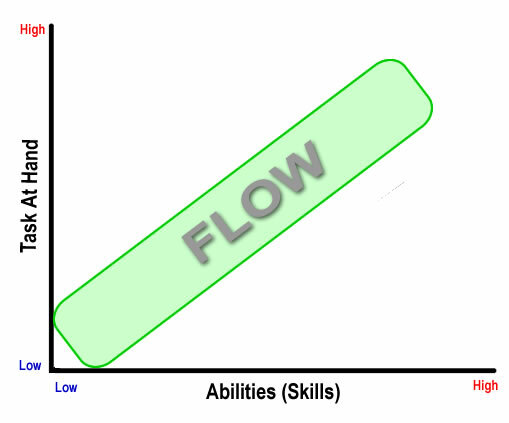 One of the keys to achieving flow is a balance between skills and the task at hand. If challenges are too demanding, frustration, worry and eventually anxiety set in and the participant is debilitated. If challenges are too easy, relative to one’s skills, then a relaxed feeling of complacency sets in and eventually leads to boredom. Boredom is where over trading has the highest probability of occurring and typically leads to diminished returns. It is only when the challenge at hand matches the skills that flow can occur. 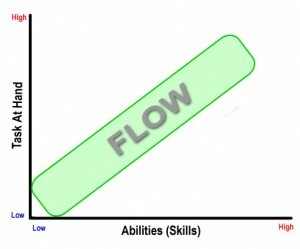 Achieving flow while trading is not an easy task, yet one that is sought out daily by thousands of market participants. High scorers in conscientiousness are more likely to achieve flow due to the underlying facets of self-efficacy, orderliness, dutifulness and self-discipline. One of the hardest things to overcome and achieve flow is not becoming too self-focused, which takes away from market focus. Bottom line is to know yourself and strive each day you participate in the market to achieve flow.